This Event closes for Online Bookings in 3 days 19 hours 19 minutes. 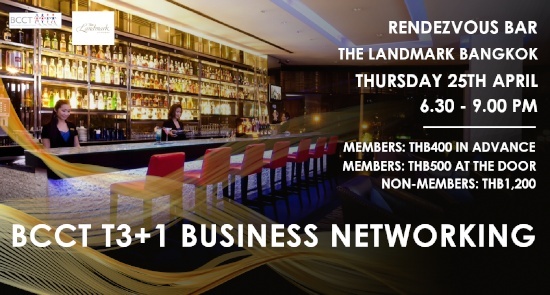 BCCT cordially invites you to BCCT T3 Business Networking on Thursday 25th April 2019 at Rendezvous Bar, The Landmark Bangkok. Spend an excellent evening networking with great business contacts while enjoying fine food and drinks in the heart of Bangkok. -THB 1,200 for non-members. NO NON-MEMBER WALK-INS.